Was in the mood for a hot dog stand egg sandwich this morning, you know the kind, couple of slices of lightly griddled white bread, one egg -yoke broken, maybe a shave of onion or sort pepper if you're feeling saucy. U Lucky Dawg on Western, formerly Flukey's, seemed a logical choice. Walking in I spied a taped-to-the-door sign advertising a Lenten Special of pepper and egg on French bread. A little fancier than I wanted, but what the hell. Sandwich was quite large with the mound of requested grilled onions on top, but best of all they had tater tots, blessed tater tots, everything tastes better along side a tater tot. This fellow made me think of ketchup loving David Hammond. what's wrong w/this pix? a hotdog annointing itself w/ketchup? jazzfood wrote: what's wrong w/this pix? a hotdog annointing itself w/ketchup? And what's in his other hand? Mayo? Nice to see that they have tater tots because I've never liked the fries there. Flagellating itself is more like it. It's really an adaptive mechanism. 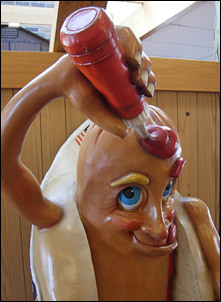 The hotdog, realizing he is in Chicago, is preserving his life by coating himself in ketchup. Like an insect that avoids being eaten by emitting a foul odor. that's deep man. very quoteable. I had the same thought a week ago when I got myself a char dog. And next time I'll do the right thing and get the tots. U Lucky Dawg on Western just north of Pratt has closed. It really went downhill when it was no longer Fluky's, but it's still a loss for the neighborhood. It once was our go-to fast food place that wasn't McDonald's but that was a treat for our kids. EvA wrote: U Lucky Dawg on Western just north of Pratt has closed. It really went downhill when it was no longer Fluky's, but it's still a loss for the neighborhood. It once was our go-to fast food place that wasn't McDonald's but that was a treat for our kids. Wolfy's is only a few blocks away. Cogito wrote: Wolfy's is only a few blocks away. I know! But we're closer to Pratt than Peterson (gotta drive to Wolfy's), and I have been eating at the spot when it was Fluky's for more decades than I care to remember. I'm really surprised that it went downhill, since it wasn't an ownership change but simply a cosmetic name change. What a shame. You're saying the owner of Fluky's just decided to change the name of the place after all these years? I don't get it. This change was fairly well-documented when it took place just about 3 years ago . 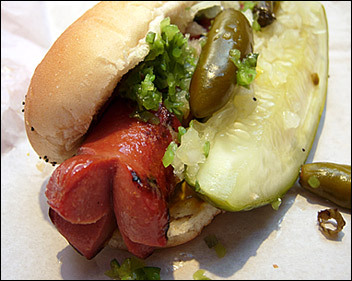 . .
press release wrote: CHICAGO--(BUSINESS WIRE)--Feb. 13, 2006--Old endings and new beginnings--Fluky's on Western (6821 N. Western Ave., Chicago), long known for serving Chicagoans the premiere Chicago Hot Dog, will be closing and re-opening as U Lucky Dawg on February 14. Larry and Randee Estes have owned this location for eight years. They believe this is the best way to continue giving Chicagoans the excellent food, service and dining experience that was the original guiding philosophy of Fluky's founder Abe "Fluky" Drexler. Thanks, Ronnie, I guess I missed that when it happened. I don't understand their logic though. If it ain't broke, don't fix it. Cogito wrote: I don't understand their logic though. If it ain't broke, don't fix it. I couldn't agree more. It seemed odd at the time to abandon the Fluky's moniker and now, looking back, you have to wonder if doing so contributed to their demise. It reminds of when CocaCola decided to "improve" their #1 best-selling product and came out with "New Coke" or whatever they called it. Since the Fluky's name has been franchised lately, or expanded in some fashion into malls and such, I'm sure they changed it either because they no longer had the rights or didn't want to keep paying for them. They may have been in the original location, but they clearly did not own the trademark. Surprised to hear it closed, but then again, I would not be surprised if the name change did hurt their business somewhat. I believe whoever mentioned about Fluky's now being franchised is correct, since I know they opened a location inside the Wal-Mart on Touhy Ave. in Niles about a year or 2 ago. dumpstermcnuggets wrote: I believe whoever mentioned about Fluky's now being franchised is correct, since I know they opened a location inside the Wal-Mart on Touhy Ave. in Niles about a year or 2 ago. That appears to be the only Fluky's open according to LAZ who comment on this a few weeks ago. This is certainly true today, but in years gone by, Fluky's was the gold standard in the neighborhood. Back in the day, I would always turn up my nose at Wolfy's (who I considered a pretender to the throne) in favor of a Polish or Hungarian sausage at Fluky's. Oh, how the mighty have fallen. Isn't there still a Fluky's inside the Lincolnwood Towne mall food court on Touhy and McCormick? This is purely an academic question, since if it is still open, it's not worth eating at.